Ponds create a focal point in any size garden offering a scene of tranquillity. The availability of garden pond liners allows for the opportunity to build a pond in any size garden and on any soil type. There are three commonly used flexible pond liners to choose from: PVC, Epalyn (EPDM) and Butyl rubber. All are easy to install and non-toxic to fish and visiting wildlife. The use of garden pond liners to create a water feature is probably the easiest, quickest and most cost effective way to achieve a stunning water feature in any garden. The flexibility of pond liners allows you the freedom to design a pond that suits your requirements without the restrictions imposed by the use of a preformed pool. Garden ponds are relatively easy to construct. First, determine the location of your pond, taking into consideration such things as shade, drainage and access to electric power to run a filter and pump. Then, all that is required is to dig a hole the size and depth you desire. When you are satisfied with your excavation and have removed all sharp stones from the bottom, insert your pond liner of choice. 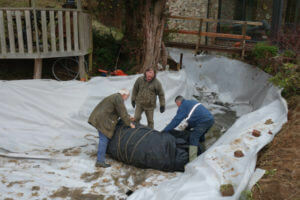 But before that it is strongly recommended that you lay a protective underlay to protect your pond liner from any possible damage because once your pond is filled and planted it is difficult (if not just a time consuming task) to repair the damage. Once both liners are in the hole, get right in the pond with your bare feet or soft shoes and push the liners neatly into the dug out area so that it covers the bottom, the sides and a region around the pond area that can be covered with rocks or any other type of edging material to hold then in place. Excess liner should be carefully pleated to follow the curves of the pond. Use a few stones placed around the edge to hold the pond liners down. Begin filling your pond with water, refold pleats and reposition rocks as required. All exposed pond liner material should be covered so that it does not deter from the look of the pond. It will also allow your pond to appear natural and to protect from long-term deterioration of the ultra violet rays of sunlight (although Epalyn and Butyl are UV resistant) and visiting wildlife whose claws may damage exposed liner. Water filters, pumps, and aquatic plant can then be added. Garden pond liners are impervious to water treatment chemicals but, it is best, however, to consult with Liners Online before applying any harsh cleaning or water conditioning chemicals to your pond. Liners Online supply PVC and rubber pond liners, protective pond underlay, pumps and pond accessories at wholesale prices. They have years of experience in the pond construction and water-proofing business so are able to offer any advise or technical support on pond materials and construction.